The chart above is a 1-4-5 progression in the key of A. There are three chords to be played over in this chart: A 7, D 7, and E 7. 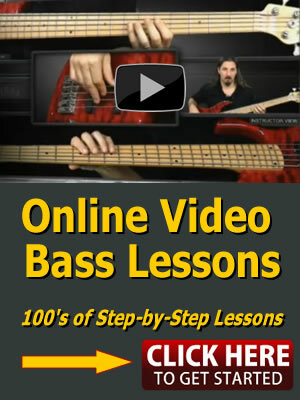 The bass line is a traditional Blues style bass line that contains the chord tones for each chord: the Root note or (1), the Major 3rd, perfect 5th, Major 6th as a passing tone to the Minor 7th. 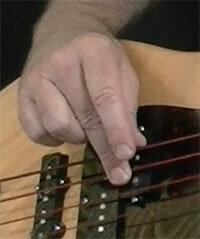 The plucking hand for the bass guitar usually using fingers 1 (index), and finger 2 (middle). This exercise will help in speed development as well as overall tonal sound of individually played notes on the bass guitar. Most of my students are unaware that they predominantly use one finger to play or use two fingers inconsistently on their plucking hand. This exercise will certainly help improve your plucking hand technique! Finger 1 (index) strikes the first note followed by finger 2 (middle) for the second note and upon ascending notes and exchanging strings will keep alternating: 1(i), 2(m),1(i),2(m), etc. BUT! Upon descending notes and exchanging strings fingers 1 and 2 use what is called a “Raking” motion: using whichever finger 1 or 2 to exchange the strings. Watching the video will better illustrate and explain this rule! To make sure you are alternating and raking properly, monitor your right hand performance by practicing with a mirror.